Forest managers strive to replant harvested sites at the first opportunity, usually during the winter following the cut. A delay in regeneration will lengthen the rotation I or more years, resulting in a proportional loss of production; and it may increase site preparation costs or vegetative competition. 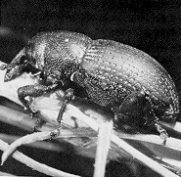 However, forest managers who replant pine sites soon after harvest often face the threat of high seedling mortality due to girdling by pales weevil, Hylobius pales (Herbst), and pitch-eating weevil, Pachylobius picivorus (Germar) (figures 1,2). In the South, the pales weevil and pitch-eating weevil are considered the most serious insect pests of first-year pine plantations growing on recently cutover sites. Seedling mortality from weevil feeding has been recorded as high as 90 percent, and 30 to 60 percent mortality is not uncommon. This publication reviews current cultural and chemical methods of controlling these insects.